You just popped the cork on a bottle of Frontenac Blanc you picked up on a recent winery road trip. After giving it a swirl and a sip, you wonder… were your taste buds off the day you went for the tasting at the vineyard? The wine you’re tasting today is missing the zip you recall: its dead on aromas, and tastes… well, like slightly stewed fruit. Or maybe it doesn’t taste like any fruit at all. What happened to the light, bright, and crisp Frontenac Blanc you tasted at the winery? While its possible you were just really “in the moment” — or maybe a little sauced up — the day you purchased 6 bottles of that most wonderful wine. It might not have been your lapse in judgement, and there could be other factors contributing to your disappointing drink today. You might have cooked your wine. So, you were out for a drive and stopped for a wine tasting — you selected a few bottles, dropped them in your trunk, and headed down the road. Maybe you made a few more stops for lunch or another wine tasting or two — with your designated driver, of course. In just 10 minutes the temperature of your parked car can climb 20 degrees over the outdoor temperature. 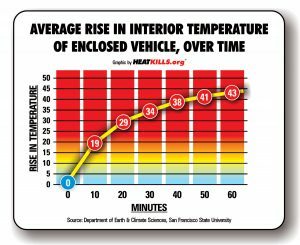 On an 80 degree day, the interior temperature of your car is easily over 100 degrees after just a quick stop — and a one-hour stop? The temperature can to 120 degrees and beyond. If your wine reaches a temperature of over 80 degrees, the flavor can be permanently tainted. At 90 degrees your wine could be cooked beyond recognition and drinkability. Ok, so a hot car in the sun — I get it. But really, how long does it take my wine to cook? Within 2-3 hours in a 100 degree car, your wine’s temperature could rise beyond repair. Of course, this shoot-from-the-hip estimate is pretty loose, and depends on a lot of factors such as the outdoor temperature, length of time your car is parked, whether the bottle is a 750ML or 1L, and whether or not you find the coveted shady spot in the parking lot. If you’re heading out on a road trip and plan to pick up some wine along the way, toss a cooler in the car along with an ice pack or two and you’ve got cheap insurance to protect your priced purchases!